Display Your Name In Style. Elegant Brass Plate On The Quality Walnut Wood Block Is Eye-Catching And Perfect For Short Messages Or For Department And Personnel Names. Your Gold-Colored Message Or Name Shines Against The Black Background. Sign Dimensions Are 2" X 10". Desk Sign Is Recommended For Offices, Courthouses, Schools And Warehouses.. Display Your Name In Style. 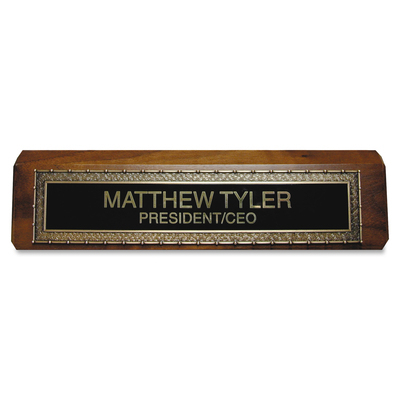 Elegant Brass Plate On The Quality Walnut Wood Block Is Eye-Catching And Perfect For Short Messages Or For Department And Personnel Names. Your Gold-Colored Message Or Name Shines Against The Black Background. Sign Dimensions Are 2" X 10". Desk Sign Is Recommended For Offices, Courthouses, Schools And Warehouses.